Red Lorry Yellow Lorry are a rock band that were formed in Leeds, England in early 1981. The band was formed by guitarist/songwriter Chris Reed and vocalist Mark Sweeney, along with bassist Steve Smith and drummer Mick Brown (who would later join The Mission). Sweeney left the band in late 1981 and Reed permanently took over as vocalist, with Martin Fagan joining as a second guitarist. The group's sound, featuring a numbing guitar drone, powerfully throbbing drums, and Reed's cavernous vocal tones, caused the Lorries (as their fans came to call them) to be quickly lumped into the then-developing gothic rock scene by pop journalists, although the band themselves preferred to cite Wire as an influence. In 2003, Reed revived the name Red Lorry Yellow Lorry and released four new songs in 2004, available via internet download only on the band’s website. 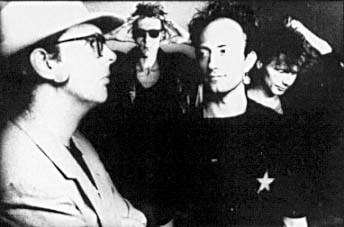 The band toured frequently in the UK during 2004 and 2005, but no additional Red Lorry Yellow Lorry material has subsequently appeared to date. In 2005, the band released Thunder in the Black Cave, a live DVD recorded in Belgium during their 2004 European tour. In 2006, Reed released an acoustic-based album, Minimal Animal, under the name "Chris Reed Unit".